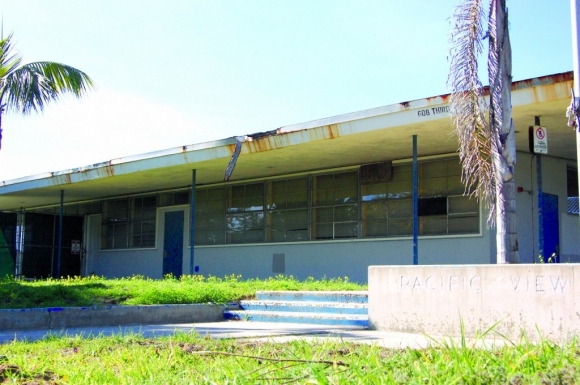 ENCINITAS — The annual debt financing payments for the purchase of the Pacific View Elementary site and Moonlight Beach lifeguard tower will be significantly higher than originally anticipated, city officials said Wednesday night. When the City Council approved the two-year budget in July, they anticipated paying $733,000 a year in debt service on the projects. City Manager Gus Vina surprised the council Wednesday when he told them the bond payments could be as high as $815,000 because the city would likely have to issue taxable bonds to consummate the Pacific View purchase, as opposed to the less costly tax-exempt bonds they were expected to issue. The increase would raise the total debt service on the land purchase from $22.9 million to $24.4 million over the 30-year life of the debt. Vina said taxable bonds might be necessary because the proposed concepts for the land’s use, both interim and permanent, likely run afoul of the code governing tax-exempt bonds because they would generate revenue, which is largely prohibited. The City Council expressed disappointment in the city staff for the 11th-hour revelation, which riled several residents in attendance who said the issuance of taxable bonds could open the property up for uses other than the concept of a performing arts center that most residents support on the site. The Council ultimately decided to delay the decision on the type of bonds it would issue to receive further information from the city’s finance team. It voted unanimously to create a subcomittee composed of Councilwoman Teresa Barth and Shaffer to draft a plan to solicit proposals for the property’s temporary use. The IRS tax code governing tax-exempt bonds would restrict the property’s use to non-revenue generating activities. Many of the concepts the community has discussed for the property, such as leasing performing arts space to local arts groups, generate revenue and wouldn’t be allowed. Finance officials said determining what activities could be allowed on the property if financed with tax-exempt bonds would be a complex process that would require tax attorneys to help the city navigate the convoluted tax code. The IRS is the ultimate arbiter of what would be allowed on the property. If they determine the activities were private in nature, bondholders would be assessed taxes, and the city would be penalized potentially millions of dollars to cover the tax bill, Finance Manager Jay Lembach said. It was the first time the city has mentioned taxable bonding as an option for purchasing the property. Residents last night said they favored tax-exempt bonds not only because they are cheaper, but because it limits what the city can do with the property. Some residents expressed concern that Vina was bringing up taxable bonds as a way to leave the property open for uses other than performing and visual arts. Others questioned if the city would have to pursue two separate bonds if they were issuing taxable bonds for the Pacific View purchase and tax-exempt for the lifeguard tower repair. Vina said the city’s finance team didn’t discuss taxable bonds until after the vote because they were unsure what the Council’s temporary plans were for the land. Once it was determined that some of the suggestions appeared out of line with what could be done with tax-exempt bonds, they promptly made alternative projections. “As more ideas were floated around, there was more need for flexibility,” Vina said. Council members, however, said that the discussions about the interim uses occurred well before the budget process began, which should have given ample opportunity to broach the possible need for taxable bonding.